The most user-friendly wine by the glass dispenser! The tutorials, visual warnings and reminders included with the product guide you and indicate all of the stages to be followed during everyday use. Plus points: the automated cleaning system cleans all 8 taps at the same time in less than 3 minutes, and without any handling of wine bottles. A first for wine by the glass serving solutions! 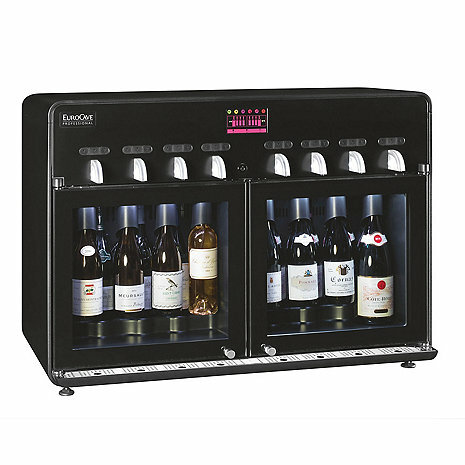 A wine by the glass dispenser which saves time and energy! You will serve a 12 cl measure in record time: barely 6 seconds! EuroCave attaches a lot of importance to the quality of wine service to ensure that each tasting experience offers the full array of emotions. Thus, Vin au Verre 8.0 has two separate temperature compartments, which means that you can offer both red and white wine, at the correct serving temperature. Finally, no more risk of waste, your open bottles can be stored for up to 3 weeks thanks to food quality nitrogen. You can even sell your best Magnums by the glass! It is now well known that wine by the glass products boost wine turnover. Apart from storing open bottles for up to 3 weeks to prevent waste, thereby allowing you to upgrade your range, you can control measures: each tap has 3 measures which can all be set independently. What’s more, the appliance records the glasses served which allows you to consult the appliance’s statistics: What are your best sales for a given period? How can you optimise your wine list? The product meets foods standards such as NSF and CE 1935 / 2004. The doors can be locked, in order to secure access to the wine bottles inside the appliance. It is also possible to lock the measures, by a code, entered on the touch screen. The manager and waiter can have different levels of use, thanks to confidential codes, which do not give access to the same functionalities. EuroCave has selected high quality materials resulting in a durable product suited to heavy-duty use: triple-glazed doors, manual buttons for serving measures, reinforced insulation.